I was looking up information on the upcoming training conference in the usus antiquior that the Latin Mass Society of England and Wales is putting on in the same location as last year's CIEL colloquium, Merton College, Oxford (see details on the training here and for a little nostalgia's sake, see a clip of Solemn Vespers in that same chapel from the CIEL Conference this past Autumn). While so doing, I happened across this very wonderful Virtual Tour of Oxford University and its various colleges (including Merton) all in 360 degrees -- including some spaces one normally wouldn't see. While I can attest that nothing replaces the experience of being there, it certainly gives you a lovely view of the various chapels, halls, gardens and the like of the university and makes the "city of dreaming spires" (as it is called) come alive moreso than still pictures can ever hope to. I believe many of you here will be interested in it, if not academically, then certainly architecturally. Back to the training conference, the NLM hopes to be able to provide some sort of report of the event. It should be a training session of the highest calibre based upon who I know will be there. For more pictures and everything you ever wanted to know about Baroque Sicily, go here, with more on the late Baroque towns and churches of the Val di Noto here. I was browsing about looking for the gothic revival work of an architect someone introduced me to lately, John Francis Bentley. While I hadn't yet found what I was looking for in that regard, I did manage to stumble across a few beautiful examples of gothic revival architecture from outside of England, where my own focus has tended to be. The second image, a theoretical project titled, Ideal Gothic Church demonstrates the lofty aspirations of Frenchman, Eugene Viollet-le-Duc. The theoretical church seems like a cross between Salisbury Cathedral with its central tower and, Notre Dame and Cologne. Hopefully, should all continue to go well, and the proper resources be available, the Tridentine Mass will be made available on campus in the near future! Recent years have seen a renaissance in interest for the thought and personality of Dietrich von Hildebrand. The Dietrich von Hildebrand Legacy Project, established in 2004, exists to encourage and stimulate this renewal, primarily by translating and publishing the writings of von Hildebrand in English, but also through sponsoring regular events to facilitate the wider reception of his many contributions. On this, the 30th anniversary of von Hildebrand's death in January 1977, the Legacy Project is happy to join with the MA Program in Philosophy at Franciscan University of Steubenville to sponsor an international conference on the theme, "The Philosophical Legacy of Dietrich von Hildebrand." Our aim is to commemorate the life and thought of Dietrich von Hildebrand, not through an uncritical celebration of his ideas, but by creating a setting where, in a spirit of profound respect and gratitude for the master, conference participants will be able to enter into a lively engagement of von Hildebrand's many rich and seminal contributions to the fundamental questions of philosophy. Anything less than this would not be fully philosophical and therefore would not be in the spirit of von Hildebrand himself. Our consideration should be guided by the same quest for truth which is the golden thread of von Hildebrand's thought and personality. While there are many important religious writings for which von Hildebrand is known, our conference will focus on the philosophical writings because these are widely neglected and stand in some respects at the heart of the von Hildebrand legacy. We believe that submitted papers can best serve this purpose if they are cast in one of two basic formats. In the first place, we would welcome submissions that aim to unpack and critically engage an idea or theme in von Hildebrand, with a view to deepening the general understanding of his contributions in ethics, epistemology, metaphysics, political and social philosophy, aesthetics, and so forth. A second basic format lies in a comparative or critical reading of von Hildebrand from the perspective of one or more philosophical traditions. We are particularly interested in hearing from those working within the Thomistic and analytic traditions as well as from those who represent strands of phenomenology other than that of von Hildebrand (for example, Heidegger, Merleau-Ponty, etc.) One fruitful possible line of development, for example, would be a comparison of von Hildebrand and his slightly younger classmate, Edith Stein (St. Teresa Benedicta of the Cross). We of course look forward to receiving those who are deep into von Hildebrand studies, yet we also extend a warm welcome to those who, sensing the importance of von Hildebrand's thought, are beginning to engage his work. Those interested in presenting a paper should submit their abstracts as soon as possible since space and time limitations will only allow us to accept a limited number of papers. Some of the excerpts of this story speak to the demand for training resources for the usus antiquior, which of course tells me that I further need to find and make the tmie here on the NLM to make such available as well. "Monsignor Michael Schmitz, vicar-general of the Florence, Italy-based Institute of Christ the King, said he has received hundreds of calls from interested clergy." "Neal Kotlarek, manager of the Catholic bookstore near the Archdiocese of Detroit headquarters, is ordering reproductions [of a Mass training video] by the case. "Usually, I just carry a few copies," he said." "Maureen Williamson, a manager at the Fort Collins, Colo.-based Roman Catholic Books, said 200 copies of its $155 deluxe edition priest's altar missal sold within two weeks of the papal announcement. She typically sells 20 to 35 a month. "We're projecting we are going to sell more than 700 by the end of the year," she said. "Now that this Mass is able to be said by anyone at any time, priests and parishes have been ordering it." In this vein, I know of another bookseller who had made available training resources for priests and they sold out of thousands of these in short order and had to put in place another run, demand was go great. "A Catholic couple, Raymond and Kathy Mylott, in the Traditional Latin Mass Community of New York recently came up with a unique initiative to express support and gratitude to the Holy Father, Pope Benedict XVI, for the papal Motu Proprio, Summorum Pontificum. Other traditionalists agreed, and the project, Te Deum Laudamus – Flowers for the Pope, is underway. The idea is to send fresh bouquets of seasonal flowers (God’s own artistry) as a visual sign of Spiritual Bouquets of prayers and sacrifices for the intentions of the Pontiff. These bouquets are being sent to the Papal summer residence at Castel Gandolfo, on Lake Albano, just outside of Rome , where Pope Benedict will be staying for the next several weeks. Although bouquets may be sent using any florist service, an American company, From You Flowers, 1-800-838-8853 (Ext 115 during the week, ask for a supervisor on weekends or after hours) has agreed to special discounts and designed the text of a spiritual bouquet to be personalized by the sender. As the call goes out across the world, the organizers hope the momentum will continue, and that this collective message of love will become a powerful font of grace for the Holy Father, the Church, and the world. If you have any further questions about this, do feel free to ask Kathy about them in the comments. Well, a certain sector of Catholic opinion is getting more aggressive, it seems. Commonweal has published what is an open dispute with the Pope's decision to permit the free choice to offer the old form of the Roman Rite. They believe that this is a secret plot to dismantle and finally bury the new form and implicitly undermine the Council that preceded the new form's promulgation. The article takes issue with a number of aspects of the older use, and praises the new by comparison, which is certainly their right. Nothing about the Motu Proprio requires anyone to prefer old to new or new to old. It broadens choice. There are a number of aspects of this article that are striking. First, the liberal spirit of the Motu Proprio is nowhere noted. One could easily get the impression that the Pope has imposed something when in fact he has broadened the options and put to an end the coercion that enforced the monopoly of the new form. Second, the article nowhere grants the incredibly obvious fact that aspects of life under the new form, because of its imprudent leap into unchartered territory, has led to the alienation of many and artificially cut Catholics off from so much of our holy tradition. Third, the article adopts the paranoid style in imputing secret motives to the Pope, whereas the motivation of the Pope is clearly presented in a personal letter, and it has nothing whatever to do with dismantling a church council, for goodness sake. After many requests, the Graduale Romanum for the extraordinary form of the Roman Rite, said according to the 1962 Missal, is now available in hardcover, two volumes at $45 each. UPDATE: Fr. Pasley has sent me corrections to the original press release, which I have incorporated into the text below. On the Feast of the Assumption, Wednesday, August 15, 2007 at 7:00 PM, Mater Ecclesiae Roman Catholic Church will celebrate the Seventh Annual Mass of Thanksgiving at the Cathedral of the Immaculate Conception, Broadway and Market St., Camden, NJ. The Solemn High Tridentine Mass will be celebrated according to the 1962 Traditional Roman Rite and will once again feature the Ars Laudis Festival Chorus and Orchestra. The Mass setting will be the Mass in B Flat, D324 (1815) by Franz Schubert (1797-1828), conducted by Dr. Timothy McDonnell. The singing of the Gregorian Propers will be directed by our Cantor, Mr. Nicholas Beck. For the seventh consecutive year, the Reverend Robert C. Pasley, KHS, Rector of Mater Ecclesiae, Berlin, NJ, will celebrate this Solemn Mass in thanksgiving for the canonical establishment of Mater Ecclesiae. Assisting Father Pasley will be the Reverend Robert Sinatra, Parochial Vicar of St. Charles Borromeo Parish, Sicklerville, NJ, deacon, and Mr. Edward Heffernan, FSSP, Seminarian of Mater Ecclesiae, subdeacon. The Preacher for the Mass is long time friend of Mater Ecclesiae, The Reverend James Bartoloma, Parochial Vicar of Our Lady of Lourdes, Glassboro, NJ. Mater Ecclesiae is a mission of St. Edward’s parish, Pine Hill, in the diocese of Camden New Jersey. Responding to Pope John Paul II’s Motu Proprio Ecclesia Dei, former Bishop of Camden, His Excellency, the Most Reverend Nicolas DiMarzio, established Mater Ecclesiae on October 13, 2000, the anniversary of the final apparition of Our Lady at Fatima. All Masses and Sacraments are celebrated according to the liturgical books of Blessed John XXIII, in the Extraordinary Form of the Roman Rite. We thank the Most Reverend Joseph Galante, present Bishop of Camden for allowing this tradition to continue and flourish. There is an interesting look at some of the less common forms of early Christian architecture at the Institute for Sacred Architecture (who publish the annual journal, Sacred Architecture) by Sandra Miesel. Here is an excerpt. I've bolded for emphasis one line which I think relevant to those of us interested in the issue of ad orientem and how that relates to the high altar, even in exceptions like these. In patristic times, when basilicas ruled the earth, a few alternative church plans dotted the landscape. We may regard these designs as Stephen Jay Gould did the Burgess Shale fossils: novel forms that left no progeny. Nevertheless, both the churches and the fossils are beautiful and worthy of contemplation. The longitudinal basilican church borrowed the shape of Roman law courts, markets, athletic facilities, and other public buildings. Centrally planned churches, by contrast, derive from Roman mausolea, imperial audience chambers, banqueting halls, and even garden pavilions. Central plans could be cruciform, round, polygonal, or polyconched and further enriched with ambulatories, galleries, and niches of varied shape. Constantine, that energetic patron of Christian architecture, built both types of churches and even mixed forms, such as in the basilican Church of the Nativity in Bethlehem with its octagonal headpiece covering the birthplace of Christ. Regardless of design, the main altar normally stood in the east of the building, not the center. To read the rest of the short article, go and visit the Institute for Sacred Architecture. I first read this story as just another news account about how a contemporary band invaded a suffering parish, thrilling some and maddening others, and so what?, it's an old story. "We wanted to engage people in a different way, to teach people how to pray in a different way," Tidaback said. "We put a different edge not just to Mass, but to the sets we do before Mass. We even do traditional Mass songs, but we put a different spin on them, make them more up-tempo and more contemporary with what's going on in the world today." But somehow the article keeps haunting me. These kids in Chicago are clearly well intended and they are probably competent musicians. They are seeking to praise God, inspire a living faith, and want to share their gifts. They acknowledge that the liturgy should not be a performance venue and are doing their best to make a contribution. But here is the problem. What they are doing in playing jazz and rock, doing full "sets" before Mass, pounding and strumming away to the beat during Mass, is--let's not mince words--utterly and completely incompatible with the liturgical sensibility of the Roman Rite, and it is thereby destructive of all the aims they believe they are seeking. I'm guessing that no one has set these people down to explain to this to them. They haven't read about the place of chant and they know none. They haven't read anything by the Pope. They have probably never been to a compelling liturgy that uses plainsong or the music of the Church. But I'm not sure that this is an excuse. If they are going to dare to make noise of any sort during Mass, they have a positive obligation to, as John Paul II urged, examine their consciences to see whether they are really submitting to the liturgical structure or trying to reinvent it to suit their own aims. For many musicians, and artists generally, the liturgy provides a terrible temptation to use in order to satisfy the ego. It comes with a ready-made, captive audience. The liturgy is important to people so simply putting one's art on display infuses the artist with a sense of his or her own accomplishment and importance. If you don't get paid to play, you can always pat yourself on the back for using your gifts in the service of others -- and oh how generous you must be. If what you seek is to make the liturgy as fun and entertaining as a hotel bar or pregame pep rally, there are always opportunities to do so, since the liturgy is not this way. Mass is not and cannot be "what's going on in the world today"; it is rather a foretaste of Heaven. It is to deter such attempts to make the liturgy conform to the world that the liturgy is a not an improvisation on a theme about God but rather a precise and prescribed unity of music, text, and rubrics that permits us to participate in the prayer of the ages--a gift from God to us--toward the aim of gaining grace. Don't imagine for an instant that the earliest Christians would have put up with the worldly approach to music at Mass. They avoided anything that smacked of pagan music, even to the point of completely eschewing metered music. They probably went too far in this respect but the impulse is a good one. Liturgy points up and beyond; it should never seek to replicate the sound and feel of a secular venue. If a musician does not know the basic chant hymnody of the Church, if the Gregorian Missal looks like gibberish, if he or she does not know the difference between the ordinary and the propers, this person has no business planning for the next liturgy. And let us say it again: the Roman Rite has its own music built in, as it were, to serve as an ideal and focal point for our artistic endeavors. We must submit to this ideal. We must bury the ego. We must stop speaking so that God can speak to us. If we are unwilling, we should take our talents elsewhere. This altar is found in the Blessed Sacrament chapel of St. Barnabas Cathedral. I've spoken on here many times before of the role of colour in regard to the liturgical arts. (See for example, Mathematics and Liturgical Art and Liturgical Arts: The Role of Colour?) The blog, The Lion and the Cardinal also briefly touched upon it last month in relation to mediaeval gothic architecture. It's an aspect of our tradition (which, incidentally, also comes out well in the Christian East) that I wish to continue to highlight. One of our readers kindly pointed me to a review in today's Telegraph, Architect, smuggler, madman, genius which is a review of Rosemary Hill's new book, God's Architect: Pugin and the Building of Romantic Britain which is a biography of AWN Pugin. "Pugin was one of Britain’s greatest architects and his short career one of the most dramatic in architectural history. Born in 1812, the son of the soi-disant Comte de Pugin, at 15 Pugin was working for King George IV at Windsor Castle. By the time he was 21 he had been shipwrecked, bankrupted and widowed. Nineteen years later he died, insane and disillusioned, having changed the face and the mind of British architecture. "Pugin’s bohemian early career as an antique dealer and scenery designer at Covent Garden came to a sudden end with a series of devastating bereavements, including the loss of his first wife in childbirth. In the aftermath he formed a vision of Gothic architecture that was both romantic and deeply religious. He became a Catholic and in 1836 published Contrasts, the first architectural manifesto. It called on the 19th century to reform its cities if it wanted to save its soul. "Once launched, Pugin’s career was torrential. Before he was 30 he had designed 22 churches, three cathedrals, half a dozen extraordinary houses and a Cistercian monastery. For eight years he worked with Charles Barry on the Palace of Westminster creating its sumptuous interiors, the House of Lords and the clock ‘Big Ben’ that became one of Britain’s most famous landmarks. He was the first architect-designer to cater for the middle-classes, producing everything from plant pots to wallpaper and early flat-pack furniture. God’s Architect is the first full modern biography of this extraordinary figure. It draws on thousands of unpublished letters and drawings to recreate his life and work as architect, propagandist and romantic artist as well as the turbulent story of his three marriages, the bitterness of his last years and his sudden death at 40. It is the debut of a remarkable historian and biographer." The book is not yet listed on Amazon.com or Amazon.ca, but it is available off of Amazon.co.uk and Penguin Canada. With all our talk recently of Comper and the Gothic revival, I feel I would be somewhat remiss to not remind folks that that great Catholic gothic revivalist, Augustus Welby Northmore Pugin, has had many of his writings put back into print by Gracewing and Spire Books. These two books are published together in a single volume at the quite reasonable price of £9.99. Aside from Gracewing, Spire Books provides its own combined edition of two of Pugin's works, one being, again, The True Principles of Pointed or Christian Architecture along with Pugin's famed Contrasts. This particular edition is a little pricier, sitting £33.95, but it also comes bound in a beautiful deep green cloth hardcover with Pugin's self-designed crest on embossed in gold on the front cover. Between these two publishers, one has access to the majority of Pugin's most significant writing. It would be nice to see the remainder of Pugin's works be reprinted, most particularly his Glossary of Ecclesiastical Ornament and his short work on Plainsong. This latter group were not Catholics, but their strategies helped to form and shift both popular opinion and the opinion of their clergy in the direction of a more traditional architecture and liturgy. There is no doubt merit in examining how they approached their situation, which might help us examine and determine strategies as to approaching similar questions in our own modern day Catholic parishes. Some of the parallels and opposition they faced are similiar to what I shall call, "continuity-based-Catholics" also face when trying to implement a reform of the reform or, now, the use and adoption of the classical use. Today is Fr. Tim Finigan's 23rd anniversary of ordination. Visit this post to say ad multos annos. I just noticed that the blog Hallowedground has a nice little photo montage up of papal Masses (or Masses in the presence of the Pope) mainly from the time of Pope Pius XII. Between Matthew Alderman and Daniel Mitsui, and plus our vestment makers that are present here, it strikes me that there are many interested and ambitious Catholic artisans out there. I'd like to encourage parish priests and book publishers to consider employing their talents. Perhaps the NLM should consider creating an inventory and online portfolio of their location, their media, and samples of their work. Some of you will no doubt recognize the name of Fr. Anthony Symondson, S.J. from some of the comments made here on the NLM by him. Fr. Symondson is considered a leading authority on the architect Sir Ninian Comper. Comper lived from 1864-1960 and was one of the significant ecclesiastical architects of the gothic revival movement. He produced some of the finest examples of gothic revival work which is comparable in greatness to the work of AWN Pugin -- though, unlike Pugin, much of it appears in an Anglican context. I wished to draw your attention to this particular text which was written primarily by Fr. Symondson and gives a comprehensive look at Comper, his times and his work. Aside from the substantive study of Fr. Symondson, which constitutes about eighty percent of the contents of the book, a complete catalogue of Comper's work, by Stephen Bucknall, is also present which gives in detail the place, date of creation and specific items created by Comper in these locations. Included as well are many historical photos of Comper's work, unspoilt by any later modifications that may have occurred (unlike the photo presented immediately above for example) -- with the only downside being that they are, of course, black and white. Indeed, when I first received the book, my first reaction (as would be the case with any art or architecture book) was to feel it would have been better to have used colour photographs. However, after having browsed colour images of Comper's work, it became clear that there was greater merit and satisfaction to seeing the work of Comper more proximate to how he himself would have designed it, and as it would have appeared in his times. As well, modern colour photographs are easy enough to come by if one wishes to locate them, but historical photographs are far less so. Notable as well is the inclusion of a text by Comper himself, Of the Atmosphere of a Church. If you are interested in the gothic revival (and well should we be in my estimation, for it was a truly rich movement and revival) the work of Comper, and this text which presents it, is certainly something you will want to have in your library. In a post a few days ago about the epidemic mediocrity in Catholic sacred music, I mentioned something that caught the attention of one of our more astute readers, who wished to expand upon the point, i.e. the idea of practicing music as an act of praise of the Almighty. From these selected verses, the reader can see the tradition of understanding fasting and sacrifice as something we do not only "for our good and...of all His Church," but also for "the praise and glory of His name." This is true for all spiritual exercises. But how does practicing fit into this? Is it not a self-centered act, only meant for the "elitist musicians" who wish to show off in front of everyone else? How could it be an act of sacrifice on the part of the musician? Moreover, is not the final performance the sacrifice of jubilation, and all else merely preparation for that moment? The process of learning a piece of music is an organic one, much like watching a plant grow. So, to say that only the "finished product" is capable of rendering praise to God is a bit like saying that a child cannot praise God, but his father can. Or it is like saying that the beauty of a sapling does not praise God even if the beauty of a tree does. Without saplings there would be no trees; without children, no fathers. Without the daily effort of practicing, there would be no musical performance worth listening to. It seems to me that practicing and performance are all a part of the same work, and so the act of praise begins the moment the musical score is cracked open for the very first time. It is not the mistakes and the bumbling around that take place during the practicing that offer praise, but rather the persistent daily effort to attain the ability to sing or play a piece of music in a manner that is truly worthy of divine worship. It is an act of devotion that comes from the musician's awareness that God is deserving of the very best. Sacred music is a sacrifice of jubilation, as the Psalmist called it, and not a self-serving act of showing off. Like every sacrifice offered by mere mortals, it is never perfect. The inability to achieve heavenly perfection should not give us cause to be complacent, however, and it especially should not lead us into presuming that all sacrifices are acceptable to God. Too often, those who sing in church operate on the assumption that since the music is for church, it's okay if it stinks. This does not make sense. Every wrong note, every mistake that is the result of a lack of effort or vigilance takes away from the dignity of the sacrifice which is offered through music. When we allow this to happen we are like the poor servant who buried his talent. We musicians should therefore resolve not to bury the talents we have but to nurture them each day and to keep in mind as we practice that what we are undertaking is no mundane, purely necessary task, but rather the first whisperings of the loud praise we shall later offer at the altar of God. For God, For Country and For Yale has a fine post on the recent renovation of St. Patrick's Cathedral in Harrisburg, which now looks exquisite with its ugly red carpeting gone and its splendid nineteenth-century Beaux-Arts style interior done up in striking aquamarine, gold and crimson, clear evidence of a pre-existing and quite vivid tradition of classical architecture in Catholic America existing alongside that of the Gothic so well-known and loved by our readers. While I dislike freestanding altars without baldachins, they have done a good job of visually integrating it with the old reredos and, more importantly, raising it on a lofty predella, thus giving it the presence required of such a place of sacrifice. The whiteness of the altar against the bright and cheery tones of the walls also constitutes a brilliant and favorable use of color to highlight the altar as the church's liturgical apex. As at Philadelphia, the tabernacle has also returned to its place at the center of the sanctuary. This is most heartening even if perhaps it is a deviation from the traditional norms for cathedrals (though not parish churches), albeit a rubrical departure once so common as to almost constitute a tradition of its own in pre-Conciliar American Catholicism. While in the ideal, a cathedral probably ought not to be seen as a teaching model for parish churches, in practice they frequently are, so this return will surely inspire others to bring Christ to the center of their sanctuaries. Surely in this instance, we cannot complain. In time, perhaps, such guidance from above will be unnecessary. I'm not certain why, other than the fact that I enjoy the liturgical arts generally, but I found myself looking through the selections of vestments over at Watts and Co.. They have some lovely items, including this vestment and apparelled amice you can purchase, which looks very similiar to the one Archbishop Burke wore for his enthronement. This use of fleur-de-lys for the y-orphrey material is something I've always found quite stunning, along with the rich, deep colours employed. I'd like to see it become more common generally. It is pleasing to see altar frontals and the like available as well. The company also offers "a unique collection of authentic 19th century textiles designed by the company’s founders G.F. Bodley, Thomas Garner and George Gilbert Scott the Younger together with designs by A.W.N. Pugin and Sir Ninian Comper." For the parish that has funds, or intends to fundraise, to re-enchant its altar, its sanctuary and what is available in its sacristy closet, this is yet one more good place to turn. Beyond that, it is also at very least a place from which to gain ideas that then might be made by others, either in your parish, or independent artisans. St. Augustine of Hippo in his Study, Accompanied by his Guardian Angel. Matthew Alderman, June 2007. Ink on Vellum, 5" x 7". Private Collection, Ireland. Richmond, VA - The sung Mass remains the normative form in the Roman Rite. Indeed, the Second Vatican Council said that singing the Mass texts ennobles the liturgy. But this is not the norm in most parishes. Many celebrants are ready to take the step, but they need training in the finer details and the confidence to begin. To provide this training is the purpose of "Missa in Cantu: A Seminar in the Sung Mass for Celebrants," as sponsored by the Church Music Association of America and St. John Cantius parish in Chicago, Illinois. The dates are October 17-19, 2007, and the cost is $165 including meals. The location is St. Cantius, 825 N. Carpenter St., Chicago, Illinois. Registration Deadline: September 17, 2007. You can register and pay online at MusicaSacra.com/celebrant. The seminar includes tracks for the new and old forms of the Roman Rite. It is designed for celebrants who have never before attempted to sing the Mass, and also those who need to refine their abilities. The seminar covers: the basics of common tones; singing the collects, readings, prefaces, and other parts of the Mass; the musical rubrics for the Roman rite; the integration of the celebrant, schola, and people; the literature and the wide range of options, vocal production and style; and much more. For more information,including schedule, brochure and flyer downloads, go to MusicaSacra.com/celebrant, or write programs@musicasacra.com. You can also write CMAA Registration, 920 Sanders St., Auburn, Alabama 36830 or call 334-444.5584. Fr. Joseph Fessio, SJ, will make his remarks at the annual Catholic Family Conference in Anaheim, California, July 28. His talk will explain what the Pope's Apostolic Letter authorizing wider use of the Latin Mass means for Catholic faithful, their parishes, and the Catholic Church in the United States. He will also clarify what the Pope meant in his comments about non-Catholic Christians, why non-Catholics should not take offense at them, and what they mean for interfaith relations. Fr. Fessio is currently a theologian in residence at the new Ave Maria University in Naples, Florida. He is also the founder and former president of Ignatius Press, the St. Ignatius Institute of the University of San Francisco, and Campion College. He wrote his dissertation under then-Cardinal Joseph Ratzinger at the University of Regensburg in 1975, and for decades was the exclusive publisher of his books in English. "A decree this month by Pope Benedict allowing wider use of the old Latin mass has spawned a veritable cottage industry in helping Roman Catholic priests learn how to celebrate the centuries-old rite." "A Web site, helpline, DVDs and a training course at Oxford are among resources springing up for priests who want to celebrate the old-style mass but aren't sure which vestments to wear or where to get them, when to genuflect, how deep to bow, or how to clasp their hands in prayer." "The Latin Mass Society of England and Wales (LMSEW) is planning a three-day "major training conference" at Merton College at Oxford University in late August: 'There has been an explosion of interest,' its general manager John Medlin said. 'The aim is to give a firmly grounded taster in how to celebrate the traditional mass and the background information you need to do it with knowledge and devotion,' he said by phone." "Siffi plans to expand his Web site, www.tridentinum.com, to help priests find the right equipment. He may also offer courses, which will be charged at cost. "I'm not in this to make money," he said. "This is a labor of love." expressive wonder that has flowed from the Second Vatican Council, would be one of the most serious dead ends we could choose. What we have in this speech an elaborate, and not very focussed, attempt to defend what has happened to Catholic music in the last several decades, and protect it against the rise of a new generation that is alert to a point that is never really mentioned in this talk: that the liturgy is not primarily about us but rather about God and thereby requires that a certain level of prayerful decorum have primacy of place in the production of art. The idea is not to capture our own spirit and experiences in song (that's a pretty good definition of what popular music is) but rather to permit the liturgy to convert and conform our spirit to the ideals of the faith. It is also striking that someone could talk so much about Vatican II without ever mentioning what the Council demanded concerning music. This point continues to be the great unmentionable fact in modern discussion of this issue. Let me finally take issue with the strong inference that anyone who doubts the merit of Christian folk-rock in Mass should be likened to a prison guard whose heart is frozen cold and who actions and words are mainly motivated by fear. Is it too much to ask that, for example, Mr. Warner at least grant that Pope Benedict XVI has legitimate concerns that don't stem from hard-hearted fear? Why does Mr. Warner feel the need to deliver such insults (however subtly)? We've spoken in the past here on a few occasions about what might be done in parishes that are designed from a modern perspective to re-enchant them, at least to some degree. This can be an easier process when one is going to permanently alter the church, but it is also possible to work in the context of temporary circumstances. A member from the The Lake Charles Latin Mass Society emailed me tonight to share their "altar-ation" for the celebration of the classical Roman liturgy. As you can see, one of the very most modern styles of sanctuaries with everything, including the altar and cross offset. In the background, a modern art like banner. Now, here is what they do for the classical use. They add a full size altar frontal, place the candlesticks upon the altar, move the cross directly behind and in the centre, remove the flowers and they have also placed some decorative panels behind which work in such a way to give the illusion of extending the visual space of the altar (and which also seem to have a joining piece which hold the actual candlesticks. Very encouraging -- and one never knows, this is where we can also consider that the type of setup being employed for the classical use here could eventually also be used for the modern use -- all of which would be very much in the mind of Benedict as part of a possible cross-fertilization to re-assert a hermeneutic of continuity. This Zenit story quotes the Pope: "Singing together in choir and with other choirs together, demands attention to the other, attention to the composer, attention to the conductor, attention to this totality that we call music and culture. And in this way singing in choir is a training in life, a training in peace, a walking together." This is a translation of this address in Italian on the Vatican site. Can anyone provide a sound and comprehensive translation for publication? alla fine di questa stupenda presentazione della grande cultura musicale della vostra terra dolomitica posso soltanto di tutto cuore dirvi grazie. Grazie per questa bella cultura. Mi è venuta in mente una parola di sant'Agostino che dice: «cantare amantis est». Fonte del canto è l'amore. Il canto è espressione dell'amore. Ho sentito nei vostri canti questo grande amore per la bella terra dolomitica, per questa terra donataci dal Signore. E nel grazie, nell'amore per la terra, è presente e risuona anche l'amore per il Creatore, l'amore per Dio che ci ha donato questa terra, questa nostra vita di gioia; una gioia che vediamo ancor di più nella luce della nostra fede, la quale ci dice che Dio ci ama. La cultura popolare che si presenta in modo così alto è un gioiello della nostra identità europea, da coltivare e da promuovere. Ringrazio tutti coloro che lavorano affinché questa grande cultura europea sia presente oggi e anche in futuro. L'educazione al canto, a cantare in coro, non è solo un esercizio dell'udito esteriore e della voce; è anche un'educazione dell'udito interiore, l’udito del cuore, un esercizio e un'educazione alla vita e alla pace. Cantare insieme, in coro, e tutti i cori insieme, esige attenzione all'altro, attenzione al compositore, attenzione al maestro, attenzione a questa totalità che chiamiamo musica e cultura, e, in tal modo, cantare in coro è un'educazione alla vita, un'educazione alla pace, un camminare insieme, come ha detto Sua Eccellenza accennando al Sinodo diocesano. Il Vescovo ha anche fatto riferimento ad un tempo triste e duro, novant'anni fa, quando questa montagna era una barriera, un teatro terribile e cruento di guerra. Ringraziamo il Signore perché adesso c'è pace nella nostra Europa e facciamo di tutto perché la pace cresca in tutti noi e cresca nel mondo. Sono sicuro che proprio questa bella musica è un impegno per la pace e un aiuto a vivere in pace. Grazie di cuore a tutti voi, al Vescovo, al presentatore, ai maestri dei cori. Vorrei esprimere il mio ringraziamento in nome del Signore, con la mia Benedizione Apostolica. Buonanotte, grazie e arrivederci. Buone vacanze a noi tutti. VATICAN CITY, JUL 24, 2007 (VIS) - August 1 will mark the centenary of the opening of the first ever scout camp, organized on Brownsea Island, United Kingdom, by Lord Baden-Powell (1857-1941), founder of the World Scout Movement. For this occasion, thousands of Catholic scouts and guides from all over Europe will meet with Benedict XVI on Wednesday, August 1, during the general audience which is due to be held in the Vatican. In a Letter to mark the centenary of the Scout Movement, addressed to Cardinal Jean-Pierre Ricard, archbishop of Bordeaux and president of the Conference of Bishops of France, and published on July 2, the Holy Father recalls the founder of Catholic Scouts, Fr. Jacques Sevin S.J. and gives thanks to God "for all the fruits which, over this century, the Scout Movement has brought." The Pope also encourages Catholic scouts and guides to continue their journey, offering "young people today an education that forms strong personalities, rooted in Christ and desirous of living exalted ideals of faith and human solidarity." Karl Keating's "Latin Mass Dream". I'm not attributing any private revelation to this, but I know some probably wonder what Karl Keating thinks about these matters. Our Schola has been captivated by this beautiful hymn for sometime, as a model of a postcommunion motet. A schola member has typeset both the original version by Heinrich Isaac (1450-1517) (download here) and the redone version by J.S. Bach. Which version do we like better? Depends on the week! Ah Jesus, with no veil between. The Fall issue of Sacred Music will feature a nice article on the original and development of this piece in the history of Catholic hymnody. Some of you would be interested to know that there is an Anglican society ("The Gild of Clerks" -- see some pictures) who pursue occasional re-enactments of medieval English liturgical rites. This can be of interest to Catholics of course because it can help provide a sense of "what might have been" with regard to the ritual and ceremony associated with these particular uses, so long defunct now. Recently this society announced it will be pursuing a re-enactment of a Sarum use liturgy. There is an academic interest here since the intent of this Gild's reconstruction is to present what they believe would have been the form seen in a more typical parish church setting of the 1490's -- as opposed to the more elaborate form that has typically been seen in modern times. 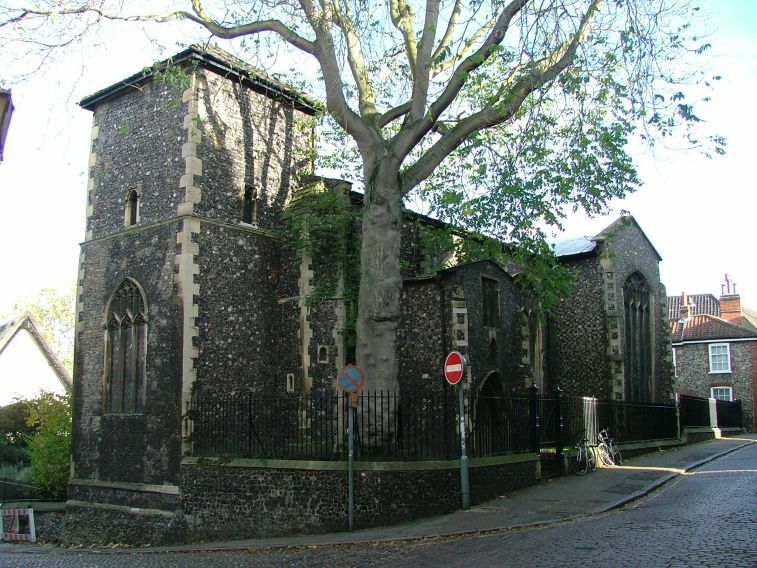 The event will be taking place at St. Peter Hungate, Norwich, a former church, now unused. 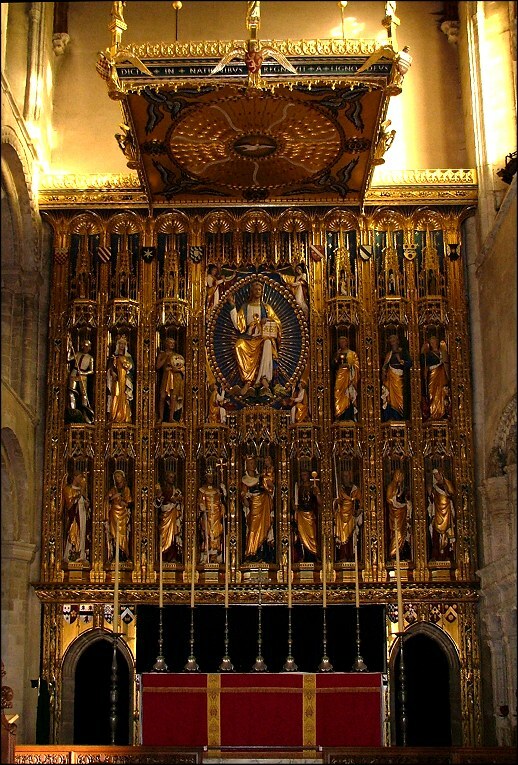 The Gild of Clerks, a group of Anglican liturgists, will be keeping the Assumption of Our Lady with a high mass and procession according to the Use of Sarum. The Gild has previously staged a number of reconstructions of the medieval York Use and this is the first time they have turned their hands to the Sarum Use. The aim is to present a typical parochial mass of the 1490s - so it will be a chant mass with a very modest altar party. The reconstruction will take place within the octave of the feast, on Saturday 18th of August at 3pm, in the medieval church of St Peter Hungate in Norwich. St Peter Hungate is a redundant church rebuilt in the 15th century by the Paston family (famous for their correspondence) and it is in the care of the Norwich Historic Churches. All are very welcome to attend. Please note that there will be a modest charge (£3.50) for what is a very substantial programme; the proceeds from this will go towards the work of the Gild of Clerks and the Norwich Historic Churches Trust. I am promised some pictures which I will present here. One of our readers, a professor in Germany, is helping a colleague who is currently researching the sources of an unedited text on the Hours of the Contemplation of the Passion, written by Christine de Pizan, probably when she lived at the Dominican convent in Poissy outside of Paris in the 1420s. They believe the book quotes prayers from a Latin Books of Hours and they are trying to identify the Latin liturgical sources that might have been used by Christine de Pizan in the composition of this text by her. Dont contemplativement me semble que je te voy agenoillie devant ce saint Sepulcre, et fus la premiere qui onques l'aourast ; si pris ainsi a dire : « Saint Sepulcre, qui en toy as encloux si riche tresor que est le filz de Dieu sauveur du monde, arche benoite qui contiens la haultesse des cieulx et la joye des anges et des benois sains, bien dois estre aouré, visité et tenu en tres grant reverence comme place [141c] tres digne. Si pry a Dieu le Pere et au Filz, seconde personne de la Trinité, esgal au Pere quant a la deité, mendre du Pere selon l'umanité, icellui mesmes et non autre conjoinct en Trinité avec le Sainct Esperit, que a tous ceulx et celles qui par devocion visiter te vendront, en pitié et remembrance de ce benoist crucifix qui en toy a esté posé, que leurs peticions justes et raisonnables soient exauciees et que en ce monde puissent tellement vivre que aprés leur trespas soient leurs ames sauvees. If anyone can help them in their search to identify this text, they would be appreciative. In his book Ein neues Lied fuer den Herrn, Joseph Cardinal Ratzinger discusses the various ways in which verse seven of Psalm 47 has been translated. Some were rather inadequate, such as "Sing a psalm." Others have come closer to the truth, such as "Sing artistically," or "Play as an inspiration." Art indeed had its beginnings as an expression of religion--the expression of religion, probably in the days before languages were spoken. It is the way in which religion has become manifest in this world from time immemorial. And yet the idea that one should "sing artistically unto God" is a stumbling block to many and a folly to others. Pope Paul VI once lamented that in modern times the Church and the artists had walked away from each other. (Paul was himself a great lover of art.) This problem goes back to the beginning of the modern era, when the Enlightenment ideals began to reign supreme. Both parties--artists and churchmen--began to feel that they did not need the other, and a terrible separation ensued which lasts to this day, as well as a most lamentable suspicion of art and artists on the part of a large number of people in the Church. In many cases, art is even seen as contrary to religion. This ecclesiastical suspicion of the arts is evidenced by the scourge of mediocrity that has descended upon sacred art in general--and perhaps upon sacred music in a most particular way. Contrary to the perceptions of some, this problem of musical mediocrity is not an issue stemming from the Second Vatican Council, for the examples of mediocre music go back at least to the 19th century. One need only scan the "White List" for a sampling of some of the most forgettable music ever written. On that list you will find works by the Cecilians, who were determined to bring back the Golden Age of Polyphony but who in fact understood very little of the theory or art of that era of music and who in fact harassed those very composers who were capable of writing truly great music. The true masters of polyphony were, for the most part, only footnoted on that "White List." Then there are the likes of the Rev. Carlo Rossini (who needs no introduction to those who've followed my comments on him) and Nicola Montani, editor of the St. Gregory Hymnal. Not all of the material in the St. Gregory Hymnal is bad, but enough of it is unimpressive so as to warrant it's own category in "File 13." As the reader can see, a rather lengthy directory of lukewarm Catholic music can be produced without even mentioning "On Eagles' Wings" or "Be Not Afraid," let alone "Mother at Your Feet is Kneeling" or "Bring Flowers of the Fairest." Mediocrity has long been the rule rather than the exception in Catholic sacred music, and churchmen of varying liturgical likes and dislikes are agreed on this point. It is seen in many places as a badge of honor and even an indication of "sincerity." Professional musicians are looked upon with suspicion, in spite of the fact that there is a very long line of distinguished professionals who devoted their lives to the praise of God through music. This lineage goes right back to the Temple in Jerusalem. Many of the Church's better musicians have heroically tried to concoct elixirs for this epidemic mediocrity, only to be brushed back or beaten into submission. It seems that many of them end up going with the flow so as to keep food on the table. One of this writer's colleagues once lamented, "If I hear 'It's good enough' one more time....." Indeed, "excellence" seems to be defined as that which is better than mediocre. It's good enough. Even if we could have done better. One of the excuses put forth by many of the apologists of mediocrity is that singing high falutin' art music is not as important as ministering to the pastoral-liturgical needs of the faithful. Generally this problem is falsely set up as an "either or." For one thing, how pastoral is it to feed the people with musical stones (whether they come from the 1860's, the 1940's or the 1970's) instead of bread? For another, what's wrong with bringing the people up to the level of the music, rather than bringing the music down to the level of the people? (This presumes a rather poor level of taste amongst the people which I'm not certain is always accurate. The ones that scream are usually ideologues who presume to speak for "The People," even while the majority of people go along their merry way.) One priest who once interviewed me asked a question along the lines of how I see the musician as a minister. My response was that the musician ministers through music, so his first priority must be music. If the music is good, we musicians are well on our way to being good ministers. If it is not good, we are shirking our pastoral duties. Indeed, it is the church musician's responsibility to God to be excellent. Any perceived popular demand for mediocrity is irrelevant. I had a teacher in college, a very successful trumpet player, who considered it his duty to God to practice every day. It was his vocation, and he took it seriously. Too often, it seems as though we church musicians get bogged down in a rut, a rut that often comes from being expected by our superiors to meet low expectations. Anyone who dares to break the cycle of mediocrity is, in most cases, worn out by the harassment that ensues. This rut brings with it all manner of frustrations which I myself have felt. It can also bring a certain kind of despair in which the musician no longer takes the care to sing or play well, because it is too disappointing to work hard on a piece of music, only to be rebuffed by those who "know better." Outside of the obvious point of picking truly artistic and beautiful music (and in saying this I do not mean to disqualify congregational singing, as much that the congregation can sing is true art, e.g. a beautiful hymn or the Missa de Angelis), the main point which I would like to push pertains to our practice habits. Practice must be the priority of the musician's day. It must come first, if not chronologically, certainly in terms of priorities. No one wants a spiritual director who does not foster his own healthy prayer life; who would want a musician who doesn't practice the music for the most important hour of the week? Practicing is a lot like a spiritual exercise; it can even be offered up as a sacrifice to God for His glory. It is something that must be attended to with regularity. Not too long ago, I was working on a Bach fugue, and had just about put the finishing touches on it when I allowed some other commitments to get in the way of my practicing schedule. I missed two days of practice, but lost two weeks worth of work on the Bach. Practicing must be done religiously. The second area I'd like to look at involves hymn playing. To be pithy: Learn the proper way to play hymns, then throw the book away and play hymns like the truly beautiful songs they are meant to be. Most organists pound through congregational music in metronomic fashion. 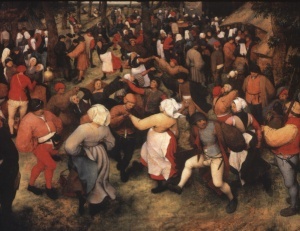 But listen to the way a group of people sing when music breaks out amongst them simultaneously. Sure, the pitch sags and the rhythms are inexact and the tempo drags, but besides all of that, they generally sing with expression. I have heard organists ruin the inherent beauty of a piece by insisting on a mathematical approach. Surely we want strong leadership from the organist, but not at the expense of beauty and musical expression. Thirdly, with every ounce of enthusiasm that we have, we musicians must cultivate a love of truly artistic music amongst the people. Most are quite receptive to this if they are approached as the intelligent people that they are. Your enthusiasm will rub off on them, and great fruit will come from this. The best way to put a stop to the culture of mediocrity is to make people aware of those things which are better than that to which they've been exposed heretofore. I have done this mostly through speaking, whether in classes or by making introductory comments during rehearsals, etc. Sing artistically. Play as an inspiration. Do not allow the mediocrity, the useless utility music, to run you down. Offer up a sacrifice of jubilation to God, who deserves the highest praise possible. Parallels in the New Liturgical Revival and the Catholic Revival in England: Another 'Second Spring'? It's a rather common claim amongst the more rupturist or rupturist oriented school to speak of "modernity" and "modern man" in a way that would suggest, ontologically, modern man is necessarily different creature from people of other eras -- and I might add, what God created human nature generally to be. This effects the way they propose we approach both the liturgy and the Faith itself. We are indeed formed by the culture which surrounds us, and I think it would be pointless to deny this, and the Church does indeed seek to address modern society in its context and terms just as missionaries would seek to speak to particular non-European cultures in particular ways. However, none of this changes the fact of a basic, common and shared human nature with corresponding shared desires and needs. In other words, there are nuances and particularlities, but there is not a 'great divorce'; there is that which ties all people or all eras together. Modern man is not divorced from his classical, Victorian or medieval counterparts as regards our human nature, just as a European man is not utterly different from an Oriental or African man. A quick survey of literature, the pursuit of religion and science, would show the common themes, desires and pursuits that cross these timelines and cultures. What societally surrounds us can indeed vary, but on the deeper level of meaning, what is relevant to classical man is also relevant to modern man. Our nature clearly disposes us to the transcendent; young children continue to dream and play out ceremony and pageantry; rituals continue to have relevance in our day to day life and given us a necessary sense of order and meaning. These things speak to us as much now as they did in the middle ages and so it is not the case that they no longer speak to us or have relevance. They are not time-bound in that sense. They teach us and they speak to the search for meaning, for the eternal; for God. Liturgically this idea manifests itself by the suggestion that such an ancient liturgy cannot speak to modern man. More ancient forms of liturgical language, the mysterious, elaborate ceremonial and vestments; concepts even of sacrifice perhaps, these things, it is sometimes claimed, are incapable of reaching modern man and do not speak to him. At heart, it would seem to be understood that somehow modern man has 'evolved' beyond these things, as though they were outmoded, radically subjective, arbitrary, or even superstitious. Therefore, the thinking would seem to go, we must rather radically modernize and innovate, we must create a rationalized, "de-mystified" and transparent liturgy; we must orient that liturgy toward our community and make it a platform for broader social causes. In the same way, we must de-mythologize the scriptures, even Christ himself and his resurrection. The trend is clear and consistent even though not shared in all aspects by those who might make such a claim about the liturgy itself. At root is the idea that modern man is, by nature, radically different from the men and women of other eras and ages, and this in turn drives the need for rupture from the past. Perhaps this idea is what drove (and continues to drive) a kind of self-assurance and over-confidence that the ancient Roman liturgical tradition as it organically grew and developed (into the modern era it is worth noting) was somehow permanently relegated to the history books and is without real interest, appeal or relevance any longer -- one thinks of the confidence in which Fr. Joseph Gelineau, SJ, famously proclaimed that this liturgy was "destroyed". Yet, here we sit today in the beginnings of the re-introduction of the usus antiquior into the wider and normative liturgical life of the Roman church, and upon a reform of the reform. "I can well remember how, at the time of Catholic emancipation, it was thought impossible that the Catholic Faith should ever regain its hold in England. Men used then, as I well recollect, to say, the superstition of Romanism cannot revive in the light of the nineteenth century. This was the sincere belief of the majority of Protestants. They were so sure of their own position, the Catholic controversy had been for centuries so powerless, the number of Catholics had been so thinned by penal laws, that the Emancipation was conceded... In those days it was believed that Romanism had nothing more to say for itself... It was believed to be superstitious in its premises, and inconsequent in its logic.... Another remarkable feature of those times... was that the Catholic Church was hardly anywhere to be seen." My purpose in quoting this is not to introduce a needless triumphalism about "victory." My point goes beyond the matter of the usus antiquior and intends to consider the question of orthodoxy and orthopraxis generally, as regards both the classical liturgy and the reform of the reform. I do see some parallels and a history lesson here. On the one hand, there is the presumption, made also by mainstream, 19th century, protestant English society, of what does or does not speak to people. It is likewise very popular for many to today say in relation to the classical form of the Roman liturgy, or even the reform of the reform, that "there is no demand for this..." or to continue to suggest it has no relevance. Regarding demand, there is an aspect of this which is true, of course, but perhaps not for the reasons thought, and the judgement is far from final and quite premature -- as premature as the judgement of protestant English society. For one, this ignores the rather limiting like circumstances and lack availability (i.e. visibility) of more traditional liturgical expressions (ancient or modern use). But beyond that, it fails to consider the deeper power that the tradition has to precisely speak to modern man in a way in which he longs for and needs. That visibility, albeit it gradually, is set to change. Like Catholic England in the 19th century, it seems reasonable to think that we sit upon the cusp of a gradual revival of tradition in both uses of the Roman rite. For the moment, like the church in England Cardinal Manning speaks of, it sits in pockets here and there, and yet, while it may not as yet seem significant in the face of the larger Catholic populace (as of yet), it has something very profound to say; something of relevance and most certainly of influence. My recent mention of Josef Pieper here raised the interest of a few readers, and I know in the past such mention has likewise received similar expression of interest. This is a great delight for me, because Pieper's thought, both as relates to the liturgy and more generally, is of intense interest to me and has been for many years. Thinking back on my own interest and that of others, I was put in mind of a paper written by one of our readers here who I knew long before blogs existed. Written some 10 years ago as part of his post-graduate studies, before he became a professor of theology, Mr. Adam Deville wrote, Toward a Culture of Leisure, Liturgy and Life: Prolegomena to Reconstructing the Eucharistic Foundations of Western Technocratic Civilization. This paper draws in a variety of themes and figures which I am sure many of you will find of interest, including the likes of Josef Pieper, Stanley Hauerwas and Catherine Pickstock, to name only a few, and directly ties into the theme of the sacred liturgy. Given the interest that continues to be expressed in such themes, it put me in mind to see if I could share it here with the NLM readership, in an effort to continue to draw out such sorts of discussions, which can only be interesting, envigorating and profitable. In fact, it has been awhile since I have myself read the paper, so I look forward to re-considering it myself some 10 years later. Perhaps a socratic exercise in not living an unexamined life. "Pieper’s argument, in sum, is that leisure and liturgy dialectically interact with one another as leisure gives rise to liturgy, which in turn both undergirds and also gives rise to further leisure in a hermeneutic circle of on-going cultural transformation. It is not a simple movement of leisure to liturgy--or liturgy to leisure--but an on- going, dialectical process of transformation in which culture and cult interact. Understood thus, we realize that the answer to the problems which Rifkin has sketched out is in two parts, neither of them separable from the other. If we wish to overcome our chronic lack of time and our perpetual busyness, leisure and liturgy must both begin at the same time to be restored to our culture. We cannot recover a leisure-based culture without the liturgy which undergirds and sustains that culture; but neither can we restore sense to the Church’s liturgical order without looking at the broader culture in which that liturgy is celebrated. "This is a critique which Cardinal Ratzinger has given authoritative utterance to, but it has been growing for some time now in a variety of places.2 It has recently been given its most intellectually rigorous expression in the recent and brilliant work of the Cambridge theologian Catherine Pickstock. Summarizing and critiquing the most important liturgical scholarship of our day, Pickstock gives us the clearest understanding to date of why the contemporary liturgy has been so problematic and how it is the traditional Mass of the Roman Rite which will once again help restore a culture of leisure which Pieper rightly saw as so necessary in our technological civilization. Put briefly, Pickstock notes that it is this Mass especially which offers a “redemptive critique of secular time, and its concomitant epistemological assumptions.” 3 The contemporary Mass, which is to say the Novus Ordo, is not only incapable of this critique but it has, in fact, disturbingly participated to a large degree in “the modern colonization of time by a lateral and abstract space[...]predicated on a violence which promotes the divisions of outside and inside, subject and object, active and passive” and, to be sure, public and private as well as culture and cult.4 I turn now to the unfolding of Pickstock's thesis in some detail both to build on and answer the question about appropriate liturgical form with which we left Pieper and also to respond in some detail to the diagnosis which Rifkin gave us in the first part." Do enjoy, and, indeed, do discuss.